Historic district sought for its calm and shady squares. 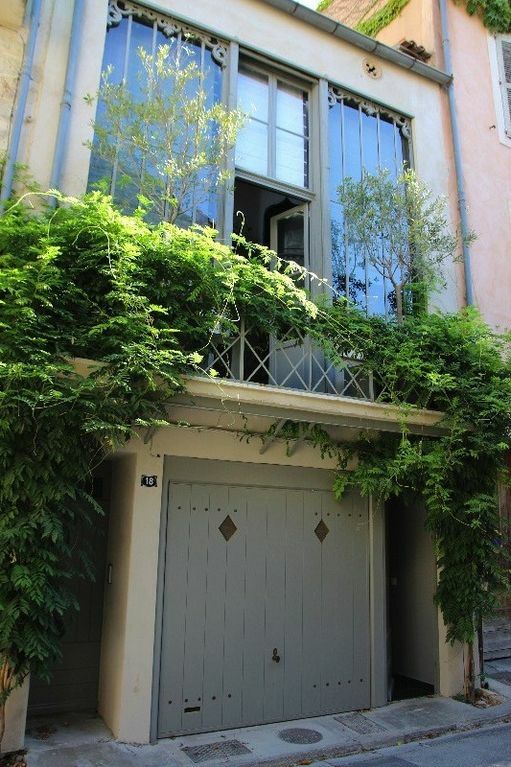 This property consists of a former artist's studio on 3 levels ('The Atelier d'artiste') and its independant studio('The Studio') on the ground floor courtyard. The 'Atelier' was built in the nineteenth century, by grafting on a house dating from the sixteenth and seventeenth century. Its charm is mainly due to the mix of ages as well as a careful and faithful to its history decoration. Ideal location close to the small squares surrounded by restaurants and to every shops, especially Les Halles,the daily provencal covered market. Everything is a very short walk away. Duo of decorators, Amaury and Gilles, passionately fond of History and lifestyle, collectors of paintings, from 18th &19th century and works of art, now decorate their mansion in the heart of the largest private garden of Avignon, just beside the 'Atelier d'artiste'. They will guide you to the landmarks and good places of the papal city. 3. Strengths of Avignon and the surrounding region. Avignon, historic town surrounded by ramparts and largest theater in the world in July, is rich in architecture, from medieval times to twentieth century. From the Palace of the Popes to the Calvet Museum, through the Lambert Foundation (Museum of contemporary art), you can discover its extraordinary heritage through its many squares lined with plane trees and its alleys. Duo of designers, Amaury and Gilles, lovers of History and art of living, paintings collectors (18th and 19th century) and works of art, now design their house in the heart of the largest private garden in Avignon , right next to the Artist's studio. They will guide you to the best addresses and places to discover in the papal city. They will pick you up for free at the train station if you wish. This house, with its size and style, atypical in Avignon, and its calm, makes you feel right away very well. Convenient location two steps from the Popes Palace, the small squares surrounded by restaurants and all the shops, especially Les Halles, the daily market where you will get all fresh produce of Provence. Amaury was a very sweet and generous host. The flat is very comfortable and warm. this was good because the weather was very windy and cold when we were in Provence. The king size bed was the most comfortable bed in all our 3 weeks of travel in Europe. Well appointed kitchen and bathroom with cozy bathrobes. We would stay here again for sure. Dear Bronwyn, thank you so much for your much appreciated review! You were SUPER guests and I enjoyed meeting you and hosting you both very much! Anything I could do for you to enjoy your next stay at our home I will! 5 Stars are simply not enough! Our host, Amaury, has thought of everything!! Avignon is such a beautiful city and Amaury's love for it really shows. He sent a driver to pick us up at the TGV station and met us at his studio. He explained everything about the studio to us. Then he brought out a map of the city and showed us where we were, points of interest,and general information to get around. He then recommended a few great restaurants for dinner and even made reservations for us! Across the alley from our studio is a lovely bar called Bar Le Complot! Which Amaury also owns. It has tapas and fabulous cocktails, set in a most charming garden! Amaury is the perfect host who has thought of every comfort you may wish. The suite is perfectly located in the center of everything, near the Popes Palace, museums and shopping. We will definitely come back!! Thank you so much Laura for your kindness, I really enjoyed meeting you both in Avignon and I'd definitely be very glad to host you again! Many thanks again for being such lovely guests! Look forward to seeing you back! Beautiful accommodations in a beautiful city! Our host Aumery was absolutely amazing! Our studio apartment was very nice and in great location! My husband and I enjoyed 4 days in the Atelier studio. It is located in a very quiet area of the town. The bed was very comfortable; kitchen well appointed; walked to market each day with a basket supplied. All very relaxing. Amaury was fantastic, his establishment across the street had the best Burrata salad I have ever had. Also you must try their cocktail 'Fritz ', delicious. Amuary was a great host! Spent lots of time with my husband and me answering all of our questions. The studio was spacious and quiet....exceeded expectations!!!! Close to center .We would definitely book again. Very unique and cozy environment. Convenient location in the center of Avignon. We had a great time staying in Avignon for 5 days. The property was clean and had all what we needed. The owner was so nice and very helpful in everything what we ask for. Highly recommend this property.